“The myth of St. Thomas in India” has been the greatest historical fraud in India and the world also and the historians have been shameless even to question such myth. Instead, they go on promote such myth aiding and abetting, as is evident from appearing so-called “research papers” in the proceedings of South indian History Congress, Tamilnadu history congress, textboks etc. It is a blot on historians, whenever, that fraud is perpetuated, nurtured or quoted in the name of history. So I post the following article of K. P. Sunil appeared in 1987, which has bearing on the subject matter. The case has been closed. And the dramatis personae prefer to maintain a studied silence. For fear that a post-mortem would reveal hidden cadavers in their cupboards. 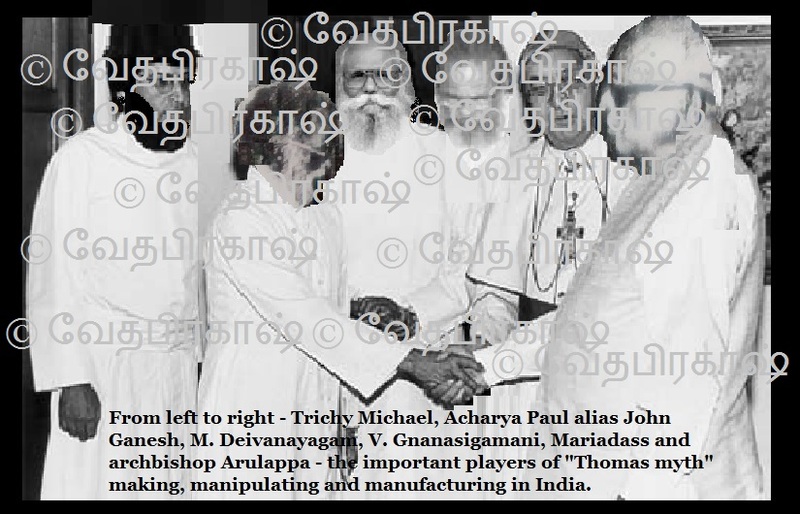 For even a superficial examination of the fraud that shook the foundations of the Catholic Church in Madras in the late seventies and early eighties indicates that a lot of embarrassing details have been swept under the mat. Reverend Dr. R. Arulappa, former archbishop of the Madras diocese, who claims to have been duped by one Acharya Paul, also known as Ganesh Iyer, is ill. Incapacitated by serious cardiac problems. In fact, it is his ill-health that forced him to retire from his post as head of the diocese. So the infamous scandal had to be pieced together from court records, police files and the ramblings of the main character-Ganesh Iyer. It all began in the early seventies. 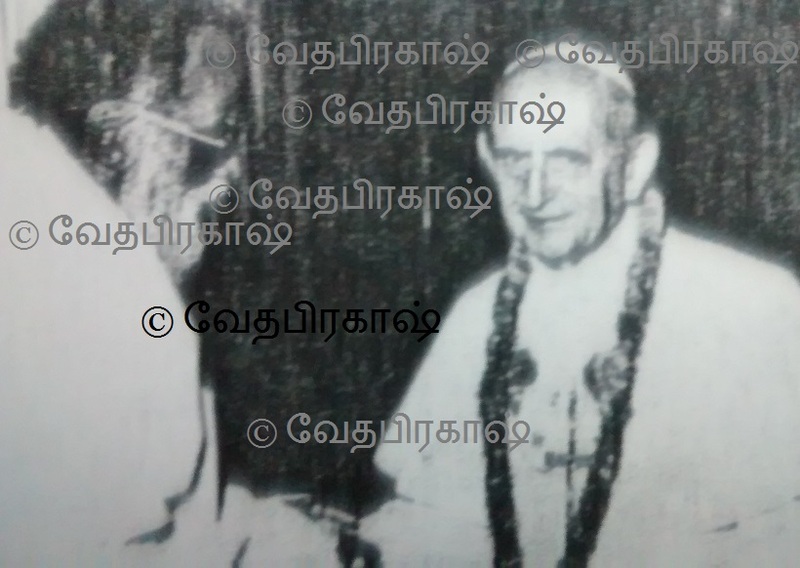 Ganesh Iyer, who had adopted the Christian faith and was a self-styled Bible preacher known as John Ganesh, went to Tiruchi in the course of his evangelical journeys and met a Catholic priest Father Michael of the Tamil Illakiya Kazhagam (Tamil Literary Society). He is reported to have presented himself to the priest as Dr. John Ganesh, professor of philosophy and comparative religions at the Banaras university, and recently returned from Jammu and Kashmir where he was involved in research on Christianity in India. Michael put him on to another priest, Father Mariadas of Sriviliputhur. John Ganesh impressed Mariadas with his mastery over Christian theology. He showed him copies of notices extolling him as a speaker. He reportedly produced letters written to him by various scholars in the fields of education and religion. He is also reported to have shown Mariadas photographs of palm leaf writings and copper plate inscriptions several centuries old. These documents, he reportedly claimed, traced the origins and development of the Christian faith in India. Since further research on the subject required money which John Ganesh claimed not to have, Mariadas took upon himself the task of locating funds for the project the successful completion of which, he felt, would provide a shot in the arm for Christianity in India. Mariadas gave John Ganesh something in the range of Rs. 22,000 toward the research. And as his own funds were depleted, he introduced the researcher to the head of the Catholic Church in Madras, R. Arulappa. Arulappa was a Tamil scholar who also had the reputation of being a researcher. He had translated the New Testament into Tamil and set to tune the Book of Psalms. He had also rendered in Tamil the life of Christ, Ulagin Uyir ( A The Life of the World ). He had learned Sanskrit and translated several Christian tenets into that language. He had also done extensive research on Tirukkural, the creation of the Tamil bard, Tiruvalluvar. Tiruvalluvar is known to modern generations through his immortal literature. The exact time of his existence is lost in the mists of the hoary past. Some historians believe Tiruvalluvar to be a product of the early Sangam period in Tamil literature, several centuries before Christ. The Tamil Nadu government bases its calendar on the year of his birth. For this purpose, it is assumed that Tiruvalluvar was born exactly 2018 years ago, i.e. in the first century before Christ. Some literary experts place Tiruvalluvar in the first century after Christ, others date him 300 years after. Just as little is known about Tiruvalluvar”s origins, his religious beliefs are also shrouded in some mystery. Attempts have been made, going by the precepts contained in his verse, to speculate about his religion. While he is widely believed to have been a Hindu and the Tirukkural considered a revered Hindu scripture, other religions too have staked a claim on him. Since the Tirukkural enshrines the ideals of ahimsa , dharma and asceticism, many experts consider Tiruvalluvar to have been considerably influenced by Jain thought. A recent paper presented by Dr. S. Padmanabhan makes Tiruvalluvar out to be a Hindu chieftain from the Kanyakumari district. Archbishop Arulappa felt that the Tirukkural was so profound and filled with compassionate sentiments that it must have been influenced by early Christian missionaries who came to South India in the first century after Christ, notably St. Thomas, one of the apostles of Christ. The Christian Church of India, considered to be amongst the oldest in the world, is believed to have been founded by St. Thomas in 52 A.D. Arulappa held the view that St. Thomas, before his martyrdom on a hill near Madras, now called St. Thomas Mount, met Tiruvalluvar and influenced the bard to the extent of converting him to the nascent faith. The theory had been propounded. What remained to be obtained was proof of such an occurrence. 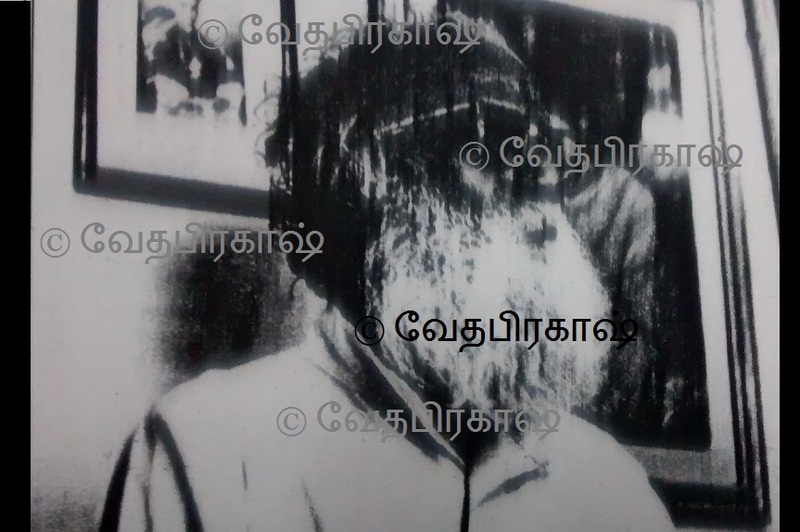 It was this that Ganesh Iyer, posing as John Ganesh, reportedly promised to unearth for the archbishop. Since this suited the archbishop”s scheme and since Arulappa was convinced that Ganesh was in a position to ferret out the evidence necessary to prove his pet theory, he engaged him to take up the research. The archbishop was apparently lulled into complacency by Ganesh”s mastery of Christian theology and his apparent sincerity of purpose. As if establishing a nexus between St. Thomas and Tiruvalluvar were not enough, John Ganesh also informed the archbishop that he could bring evidence that the three wise men from the East who prophesied the birth of Christ were none other than the epic Hindu sages, Vasistha, Viswamithra and Agasthya. In 1975-76, John Ganesh began his research. And the archbishop started funding the same. Ganesh produced photographs of palm leaf writings and copper plate inscriptions at periodic intervals. When the archbishop asked to see the originals, he was informed that they were stashed away in the safe custody of the archaeological departments and museums all over the country. It would therefore, not be possible to persuade these agencies to part with the priceless documents. He, however, promised to get his photographs authenticated by the respective agencies themselves. Thereafter, all photographs produced by Ganesh Iyer before the archbishop bore seals of the museums and departments from which he claimed to have obtained them. Using the funds provided by the archbishop, Ganesh Iyer made a pretence of travelling extensively. It was a well-orchestrated programme. He would first inform the archbishop that he was going to Kashmir in connection with his research. Next, the archbishop would receive letters from some Christian and Hindu religious heads in Kashmir informing him that they had come across Ganesh Iyer or, as he now called himself, Acharya Paul. The letters spoke in superlative terms about his sincerity of purpose and his noble research. Whatever doubts the archbishop may have entertained about his researcher vanished in the face of these letters from eminent personages. More money changed hands. Though he was quite poor when he first met the archbishop, by the time he was through, Iyer had his own house in Srirangam. He owned two cars. He had purchased considerable gold jewellery for his wife and daughters. He had substantial deposits in banks in his name. Most of the funds for the research had come from individuals and organisations abroad. 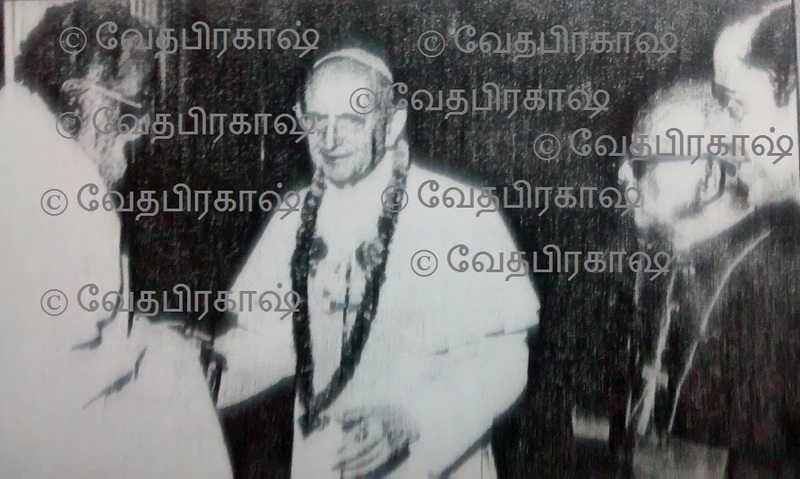 If Iyer is to be believed, the archbishop even made out his personal car in Iyer”s name for a nominal Rs. 25,000. .i.Iyer;Iyer himself claims that he had not paid anything. Questions were being asked around this time about the large sums of money being given to Acharya Paul for his research. The sceptics demanded proof that something tangible, that would benefit Christianity in the long run, had indeed been achieved. Only the archbishop”s pre-eminence prevented a direct confrontation. In 1976, Iyer obtained a passport in the name of Acharya Paul. In 1977, accompanied by the archbishop, he went abroad. To the Vatican, among other places, where he had a lengthy audience with Pope Paul VI. The duo then visited several religious congregations and spoke about comparative religions. Everywhere he went, he spoke about the origins of Christianity in India and about his A monumental research while the archbishop displayed the evidence. Money was collected for funding further research. During their absence from India, individuals inimical to John Ganesh had organised themselves into a powerful force. Even as he was relaxing in his home in Srirangam after his return, the archbishop was pressurised to file a complaint with the police. That he had been duped by Ganesh Iyer who had claimed to be a bachelor, but was in reality a married man. That he had defrauded the archbishop to the tune of around Rs. 14 lakhs in the name of research into Christianity. Investigations into the sordid episode began. The police, led initially by Inspector Seshadri and later by Inspector Chandraya-perumal, searched Iyer”s residence. They unearthed the A originals of all the photographs produced by Iyer as proof of his research-writings on strips of brown paper cut to resemble medieval palm frond writings, pasted on sheets of white paper. The police learnt that the photographs had been taken at a studio in Tiruchi and this led to the seizure of all the relevant negatives. The police discovered how the photographs had been authenticated by various institutions-seals and rubber stamps of all the concerned institutions were lying in Iyer”s home. Letter-heads bearing the names of various Hindu and Christian scholars were recovered. The letters purported to have been received by Iyer from these personages, which he allegedly used to dupe Mariadas and later the archbishop, were declared to be clever forgeries by the state handwriting expert Srinivasan. The writing on these and the writing on the brown paper, though cleverly disguised, compared favourably with Iyer”s specimen. Account books showing details of amounts received from the archbishop and the amounts spent by him were recovered. Iyer”s antecendents were thoroughly investigated and it was proved that he was a middle school dropout, not having studied beyond standard seven. 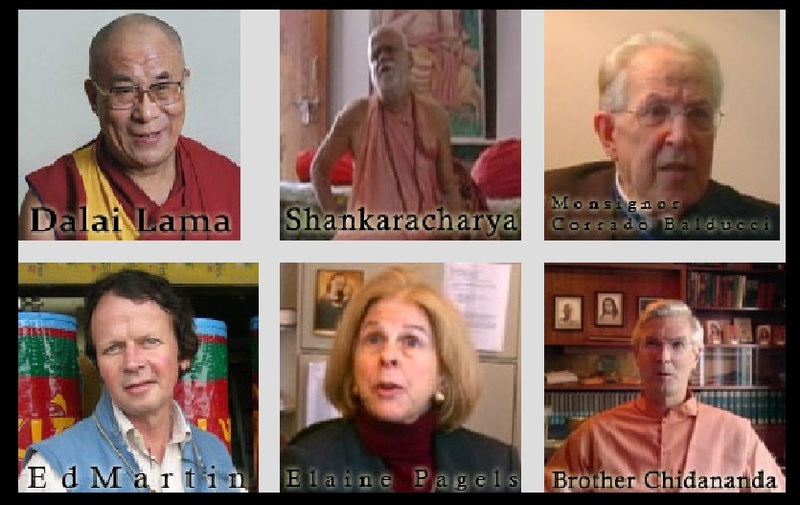 Further confirmation was obtained from the Banares university that they did not have Dr. John Ganesh on their staff either teaching or doing research into philosophy and comparative religions. The police case was complete. On April 29, 1980, Iyer was arrested and placed under remand, while prosecution proceedings were instituted under sections 419 (cheating by impersonation), 420 (cheating and dishonestly inducing delivery of property), 465 (forgery), 471 (using as genuine a forged document), 473 (making and possessing counterfeit seals with intent to commit forgery) of the Indian Penal Code and under section 12-B of the Indian Passports Act (obtaining a passport supplying false information). 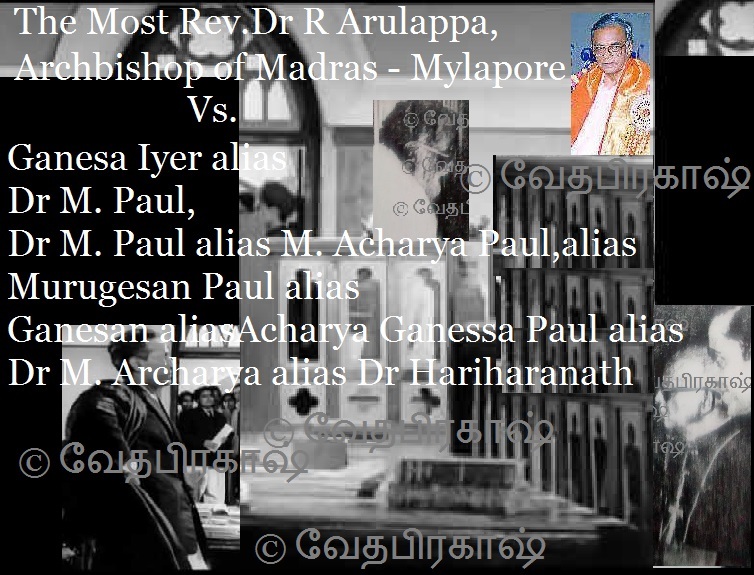 Archbishop Arulappa testified against Iyer before the court. Iyer initially pleaded innocence, but later admitted to the fraud on all counts. He prayed that in view of his advancing age and critical family circumstances, he be shown leniency. On February 6, 1986, P. Aruvudayappan, second metropolitan magistrate, Madras, delivered his judgment in case number 100087/82: A Taking advantage of the soft attitudes of public witnesses 2 and 3 (Father Mariadas and Father Arulappa), he averred, A the defendant (Ganesh Iyer) had taken from them about Rs. 13.5 lakhs between 1975 and 1980. This has been clearly established. Taking into consideration the nature of the offences, the defendant is being held guilty under various sections of the I.P.C. and has to undergo 10 months imprisonment and 5 month”s rigorous imprisonment under section 12-B of the Indian Passports Act. These sentences are to run concurrently. He had been arrested on April 29, 1980 and let off on bail on June 27, 1980. These 59 days of imprisonment are to be deducted from the total sentence as required under section 428 of the code of criminal procedure. The magistrate”s judgment notwithstanding, doubts still linger. Why were the archbishop”s suspicions not aroused until he had handed over a whopping Rs. 13,49,250 (according to records, though Iyer claims to have received far in excess of that sum) on a spurious research project? Why had the archbishop not bothered to verify the authenticity of the A documents produced by Iyer with the museums and other institutions concerned, directly? Why did he not bother to accompany Iyer to the actual site of his A research when he had found time to accompany him to Rome, the Vatican, Germany, France, Spain, the United States? With the archbishop still indisposed, answers to these questions are not forthcoming. What is even more curious is that even as criminal proceedings against Iyer were in progress in the magistrate”s court, a civil suit for a compromise had been filed in the Madras high court. The compromise decree was taken up immediately after the conclusion of the criminal case. Since Iyer had admitted the offence, his jail term was reduced to a mere two months imprisonment. And since he had already served 59 days of remand, this period was adjusted against the sentence. In other words, Iyer, who had defrauded the archbishop to the tune of about Rs. 14 lakhs, was let off without any further punishment. He was ordered to forfeit all claim on the money given to him by the archbishop. Accordingly, the ornaments and money seized from him by the police were returned to the archbishop. As part of the compromise, Iyer was allowed to retain the large bungalow he had purchased with the archbishop”s money. A I agreed to this compromise because there was nothing else I could do, says Iyer. His viewpoint in understandable. For, going by the lower court”s verdict, he would have not only had to serve 5 months of rigorous imprisonment, but would have automatically had to forfeit all his properties including the house. Why the archbishop agreed to the compromise is not understandable. Today Ganesh Iyer lives on the first floor of his house in Srirangam—the lower portion is let out on rent, enabling him to receive a monthly income. He is by no means affluent, but is certainly a far cry from the penury to which his family and he would have been consigned, if it were not for the compromise. Father Arulappa is convalescing, recovering from a major surgery. He has handed over the mantle of archbishop to Reverend G. Casimir on A health grounds . And the case, though officially closed, remains in many minds, an unsolved mystery. Originally published under the title “Hoax!” in The Illustrated Weekly of India, April 26 – May 2, 1987, Bombay. Is Indian Christianity built on frauds and forgeries? http://vedaprakash.indiainteracts.in/2007/11/24/christianity-in-india-historical-frauds/I find the following write-up which gives connecting details of historical frauds carried on by the Christians, of course other details about the Christian healing centre, which has been in news for alleged killing of many and disposing the bodies. The Indian historians have to respond how such questionable activities have been going on in the name of history and all historians are keeping quite? This is the html version of the file http://www.scribd.com/word/download/11669?extension=pdf. To link to or bookmark this page, use the following url: http://www.google.com/search?q=cache:Zmkh5CjcoykJ:www.scribd.com/word/download/11669%3Fextension%3Dpdf+divine+retreat+centre+kerala+murders"hl=en"ct=clnk"cd=8"gl=inGoogle is neither affiliated with the authors of this page nor responsible for its content. turned a deaf year to the public plea against the anti social activities at the Center. investigation for fear of Christian backlash. and praised and admired their activities in public thus endorsing their illegal activities. was carried out in Divine Retreat Centre on 30 September and 1 October 2006.
centre receives huge funds from the Social Welfare Department of Kerala government. Some 9000 people are on the voters list of the christian faith healing centre. proceedings when police raided the christian faith healing centre in Muringoor, Kerala. and harassed HIV/AIDS patients who were being cured at the Divine faith healing centre. centre as he also felt mentally challenged at times. Vallooran, a Director of Divine Retreat Centre was arrested by the police. of India and its unholy nexus between the Marxist Party. Paraya christians of Kerala operating from Tamil Nadu even created martyrdom for St.
selling sacred Thomas sand by the kilos, claiming that Thomas walked all over that area. denounced Deivanayakam’s book as “trash in the name of research.” The visit of St.
filed in the Madras High Court at the same time that the criminal case was going on. Ganesh Iyer had spilled the beans soon after. Opus Dei and KGB in front of Rajiv Gandhi to continue the hold of christians in India. supported by the Christian groups who provide money and reasoning for what they do. killing in India should be declared as terrorist organizations by the Indian government. Christianity with only seventy five million human beheadings to its credit. As our eminent, progressive, secular, broad-minded, open-minded, liberal and what-not historians can discuss about Rama, Krishna etc., now, perhaps, time has come to discuss about this type of frauds, as they are contemporary and we can get evidences. Surprisingly, why the historical forums like Indian History Congress, South Indian History Congress, and so many State History Congresses conduct conferences inviting the eminent historians for giving endowment lectures etc., do not bother about such a serious historical frauds, spurious copper plate manufacture, forged-documents and others going on in the name of History? Jesus trail in India: A Hollywood movie for Indians! Jesus married to Mary Magdalene, raised children and died in Kashmir! Perhaps, no true Christian would believe in such stories. Yet, “The Hindu” carries such myths under the guise of “history, theory….” and so on! It has to be noted that “The Hindu” has been involved in spreading the “Thomas myth” in India, in one way or the other and now, it lends its promotion to spread the “myth of Jesus in India”! Therefore, the Christian or Catholic hold on the “Mount Road Maha Vishnu” [as Karunanidhi used to mention] is intriguing. Action adventure account of Jesus’ lifeNew Delhi: Hollywood is to fill in Jesus’ “missing years” in the Bible with a story about him as a wandering mystic who travelled across India, living in Buddhist monasteries and speaking out against the caste system. Film producers have delved into revisionist scholarship to piece together what they say was Jesus’ life between the ages of 13 and 30, a period untouched by the gospels. The result is The Aquarian Gospel, a $20-million movie which portrays Jesus as a holy man and teacher inspired by a myriad of eastern religions in India. The movie takes its name from a century-old book that examined Christianity’s eastern roots and is in its 53rd reprint. “The Bible devotes just seven words to the most formative years of Yeshua’s life saying: ‘The boy grew in wisdom and stature’. The [film] will follow Christ’s journey to the east where he encounters other traditions, and discovers the principles that are the bedrock of all the world’s great religions,” said Drew Heriot, the director, whose credits include the cult hit The Secret. The film, due for release in 2009, sets out to be a fantasy action adventure account of Jesus’ life with the three wise men as his mentors. Although the producers say the film will feature a “young and beautiful” princess, it is not clear whether Jesus in the movie is to have a love interest. The producers say they are hoping for commercial and spiritual gains. “We think that Indian religions and Buddhism, especially with the idea of meditation, played a big part in Christ’s thinking. In the film we are looking beyond the canonised gospels to the ‘lost’ gospels,” said William Sees Keenan, the producer, who is currently making Lindsay Lohan’s Poor Things. “We are looking at new themes. In our story Jesus was loyal to the untouchables and he defended them with his life by saying that everyone could read the Vedas,” said Mr. Keenan. India and to the Tibetan region as a young man. Indian experts claim that documentary proof remains of this visit. More dramatic are the claims that Buddhism had prompted the move from the “eye for an eye” ideology of the Old Testament to “love thy neighbour” in the New Testament. In 1995 a German religious expert, Holger Kersten, claimed that Jesus had been schooled by Buddhist monks to believe in non-violence and to challenge the priesthood. Mr. Kersten’s book is a bestseller in India. Hollywood can fill in Jesus’ “missing years” or anything in the Bible with a story about him as a wandering mystic or adventurer or revolutionist, but it has no business to spread myths and lies as such motive raise other questions. 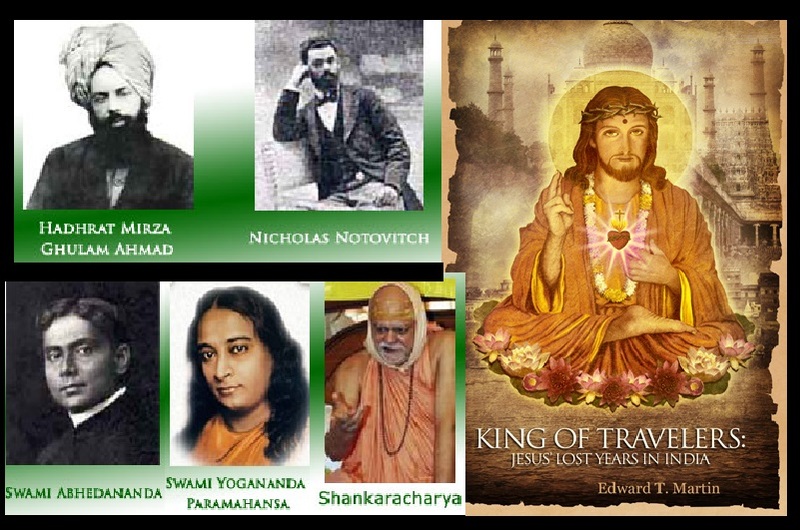 Indians have to be told clearly that there had never been any historical Jesus and while dealing with mythical Jesus and connected so-called fabricated bibles, there have been many such fables making him to travel to Egypt and so on, but to bring him to India is totally unimaginable even for Christian mind. To say or claim that he “travelled across India, living in Buddhist monasteries and speaking out against the caste system” etc., as mention clearly expose that the film-makers have other political and social manipulative agenda under the guise of film and myth-making . Film producers with revisionist or any scholarship with $20-million or more can produce any movie, as Indians or Hindus have no match for such sophistication and trickery and they can never produce any counter-movie. It can be a fantasy action adventure account of Jesus’ life with the “three wise men” as his mentors, but such exigency exposes the aiding and abetting the frauds and forgers of many scholars who have been notorious enough to indulging in such shameless act. The Madras Archbishop Arulappa did it with just Rs. 14 lakhs in 1980s, but got red-handed as his accomplice got exposed for his spurious research on the same subject matter! Although the producers say the film will feature a “young and beautiful” princess, it is not clear whether Jesus in the movie is to have a love interest. So what, Mary Magdalene was there according to them! William Sees Keenan, the producer has made another point: “In our story Jesus was loyal to the untouchables and he defended them with his life by saying that everyone could read the Vedas,”! So, he is going to defend the cause of Dalits! All Christians go to take the movie and use for their evangelical activities as a part of their “Liberation Theology”! Pope Gregory, who is very often blamed for nurturing “Caste system” in Indian Christianity for the issue of the Bull would be exonerated as Jesus himself supported the Dalits that to he had been very loyal to them! An Indians or Hindus would hope that William Sees Keenan would print Vedas and circulate everywhere as anyone can read Vedas! From where they got such wonderful and fantastic ideas? It is answered: The theory that Jesus’ teachings had roots in Indian traditions has been around for more than a century. In 1894, a Russian doctor, Nicholas Notovitch, published a book The Unknown Life of Christ, in which he claimed that while recovering from a broken leg in a Tibetan monastery in the Ladakh region, close to Kashmir, he had been shown evidence of Christ’s Indian wanderings. He said he was shown a scroll recording a visit by Jesus to India and to the Tibetan region as a young man. Indian experts claim that documentary proof remains of this visit. And what about the veracity and authenticity of such scrolls? Fida Hassnain, former director of archaeology at the University of Srinagar claims, “I have seen the scrolls which show Buddhist monks talking about Jesus’ visits. There are also coins from that period which show Yuzu or have the legend Issa on them, referring to Jesus from that period”. Mr. Hassnain, who has written books on the legend of Jesus in India, says there was extensive traffic between the Mediterranean and India around the time of Jesus’ life. The academic pointed out that in Srinagar a tomb of Issa is still venerated. “It is the Catholic Church which has closed its mind on the subject. Historians have not.” However, why he has not mentioned the full story that Jesus married Mary Magdalene, begot children and died there like men. Note, all these narrations would go against the basic tenets of Christianity, as crucifixion, resurrection, ascension etc., are totally denied here. We do not know as to whether Fida Hassnain has made such comments as Muslim, believer of Quaran or otherwise, as Quaran says Jesus was taken to an elevated place, where waters were flowing and he was survived thereafter. That is he was not crucified! Anyway, it would be interesting for Indians to watch the movie with a lot of romantic theology at the cost of Hollywood! John Dayal, president of the All India Catholic Union claims that “I have personally investigated many of these claims and they remain what they first seem: fiction,” but he has never questioned such frauds already taken place in India! 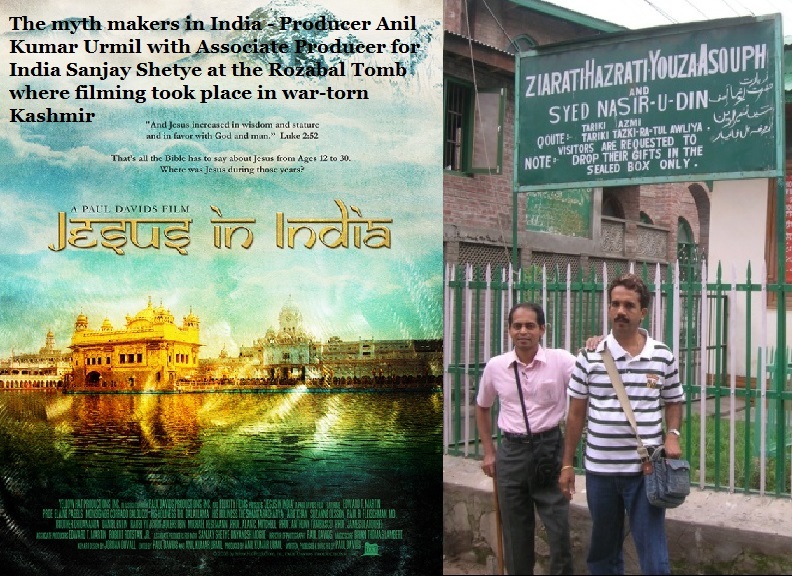 The Catholic Church in India could dismiss the film as just “Hollywood filmmakers in search of a new audience rather than the truth.” Aware that religious passions are easily inflamed, after the Da Vinci Code film sparked protests among Indian Christians, its spokesman said that a movie about Jesus in India was “fantasy and fiction.” But, they cannot be double-speak as in the case of “Inculturation”, “Inter-faith / religious dialogue” etc. Hope Hindus, secular Indians and others have wonderful enjoyment after “Da Vinci Code”! As one Pope claimed, “The Jesus Myth always serve the purpose”! How he came to India? How many days, he took? How he took Mary Magdalene with him? In which route he came? By cart, bus or plane? Whether he purchased ticket or not? Who was the driver and conductor? Whether they knew driving or not? Whether they had licence to drive and carry Jesus? The 17 years period is not a joke. How he spent the time? He may compose a poem also about his sojourn!